Ambedkar Jayanti is best celebrated by remembering and swearing by the Constitution, even today! This was sort of a ‘rallying cry’ for us who got into local trains on April 14th, and spoke to people about Dr. Ambedkar on the occasion of his birth anniversary. 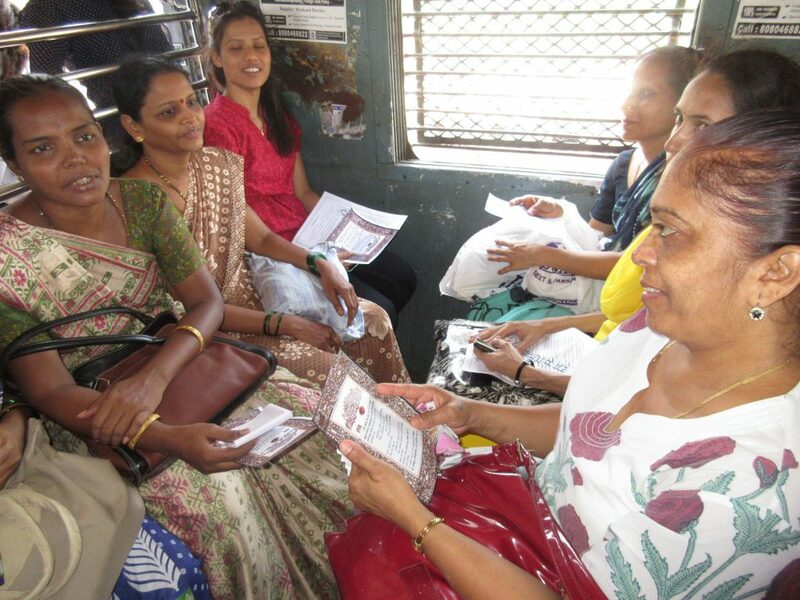 Anubhuti had organised a train campaign to speak to local train travellers in Mumbai about the Constitution, its relevance to us today, and about the real power in a Democracy being with us, the people! We also thank the volunteers who were equal partners with us on this campaign. Mumbai’s local trains have for long been symbols of the city’s cosmopolitanism, work life, and shared (read cramped :P) spaces. We have made life-long friends with our fellow travellers, had intense political discussions, sung songs, celebrated all sorts of festivals and much more – keeping our usual prejudices behind and out of the train. We have fought with people in various languages, eaten food of people from all castes, participated in festivals of people from all religions, and most importantly, created a shared workers’ culture which has spilled into our out-of-train lives too. This space therefore seemed to be an ideal space to speak about democracy, equality and unity. We entered the local trains armed with our Constitution Preambles (yes, the ones we all used to recite every day in school), a few songs, a dafli and our strong beliefs in Democracy and Rights :). We struck up a discussion with people about how today, on Dr. Babasaheb Ambedkar’s birth anniversary, it seems important to revisit our understanding and beliefs in the Constitution which was penned under his leadership 67 years ago. That if we exercise our rights, we must surely be believers in our Constitution, since that is where our rights have been sealed as undeniable. That if we know of our powers in the Democracy to be the highest since we are the people of the country, then we are believers in our Constitution, since that is where we derive this power from. That simply, if we have ever questioned a figure of authority, an injustice, a lack of a job, an instance of sexual harassment, or just experienced being an independent rights-bearing individual, we are surely believers in the Constitution since that is where all of these are enshrined. We reminded the travellers that there are many times that we might have been swayed by our beliefs in other ideologies – of caste, class, religion, language, culture, region, and so on. All of these might have their merits, but while all of these divide, the ideology of the Constitution is the only one that unites. It is the only one that puts all of us – irrespective of above ideologies or identities – on the same ground. We then asked the train travellers to recite with us the Preamble, once again like we did in school, but this time while understanding the true import of its words. Many has started listening to us with some scepticism, but most ended up reading the Preamble out loud, expressed their thoughts about the constitution and their rights, stated themselves to “have always been Savidhaanvaadi (Constitutional)” and took extra copies of the Preamble home or office with them. All in all, a wonderful discussion of people’s rights and the democracy, in our wonderful (sometimes packed) Mumbai’s local trains.